On the one hand, in a hung Parliament with Conservative and Labour Party discipline splintering under the conflicting pressures of Brexit, the Speaker's procedural rulings have real significance, as when he ruled that the government could not simply keep bringing back its twice-defeated Brexit deal. Ministers were furious, but a lot of MPs quietly agreed that the convention was that the same question could not be repeatedly put to them, in the hope that they would eventually give a different answer. But many also wondered why the same rule was not applied to other propositions, and the Speaker has been challenged again and again on this point. He has nuanced answers, but his critics don't want to hear them. He then went further and announced that he would not permit the Clerks in the Commons Table Office to accept a "notwithstanding" motion from the government, which would seek to over-ride his ruling. And that ruling has led to a great deal of solemn head-shaking on the constitutional nerd circuit, with a number of eminent commentators believing he had over-reached. A behind-the-scenes effort is under way to find a suitably elegant ladder for him to climb down. Meanwhile, his temper appears to be fraying. On Monday there was a nasty spat with Conservative ex-whip Greg Hands (one of the architects of the attempted coup against him at the end of the Coalition Parliament), which ended with the Speaker making a public apology the next day, for words spoken "in the heat of the moment". 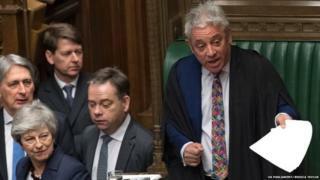 On Wednesday night, tempers frayed again with the Speaker clashing with the former Conservative chief whip, Sir Patrick McLoughlin in scenes that saw him lose control of the chamber as Conservative MPs bayed their fury. The two have form - when Sir Patrick was chief whip in the Coalition years, the two had an astonishing red-faced, finger-jabbing, stand-up row in the Chamber, and while there was no similar loss of control this time, their latest clash had a real edge to it. Once direct attacks by an MP on the Speaker were taboo. This week there have been dozens, in the chamber and online. Few Tories, from the Leader of the Commons, Andrea Leadsom, to lowly backbenchers, now think that they will do themselves any harm with their colleagues by having a pop. A good barometer of Mr Speaker's fortunes is the chairman of the Procedure Committee, Charles Walker. He is a close Bercow ally, one of the supporters who dragged the Speaker to the Chair in the traditional ceremony on his election. But he is also vice-chair of the 1922 Committee, the voice of Conservative backbenchers, and, as already noted, the troops are not happy with the conduct of his chum. In the past, he has been the one who coaxed the Speaker away from confrontation with his Tory critics and the issue of the "same question" rule may see another intervention. But the real salve to Conservative anger about the Speaker is the prospect that he will not be in the Chair for much longer. He is approaching a decade as Speaker, well over the nine-year term limit he promised in 2009. Would-be successors have bided their time and now prowl the corridors of Parliament lobbying for support. And if the great Commons crisis over Brexit resolves itself, the moment for change will be ripe.